I was checking out a fellow costumer’s blog, when I came across a fabulous steampunk coat she’d created for this fellow’s wedding. From there, I clicked on the fellow’s site, to see more pics (because this was a marvelous wedding, folks, filled with tall ships, bustles, and rayguns!). Wow. Just wow. 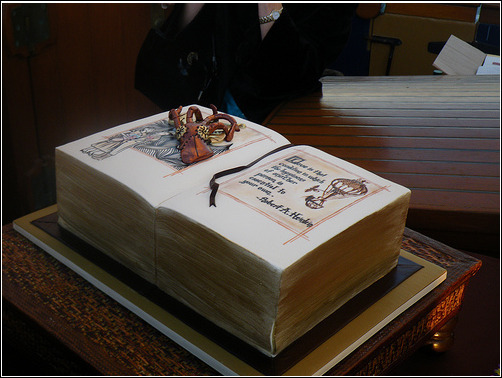 And from there I went to the cake designer’s site, and you have got to go look! From the gallery menu, don’t miss the purse and shoe cakes in the “haute couture” section or the children’s “pop-up book” in the children’s cake section. Unbelievable. And the prices seem reasonable, too, considering that if I bought a cake like that I’d never be able to cut it up and eat it – I’d want to put it behind glass and stare at it like the piece of art it is! The Cheap Chick Empire is a marvelous thing. Check out her website for fabulous tips to save money, find those awesome sales/deals that make you feel good about spending money, and just to prove she’s truly one of us, she even has a weekly feature when she ‘fesses up to her personal victories and failures (fast food and Target seem to be her Achilles’ heels!). After reading her blog for awhile now, I’m feeling inspired to impart my own frugal-living wisdom to you. I know you may think you only come to my blog for Dr. Who and Abney Park updates, but trust me. On occasion (granted it’s more rare than I’d prefer) I actually am frugal. And even more rarely, I have wisdom! Tip #1: Why pay money for those skin-scrubs that (even when they say they are all-natural) are most likely packed with nasty things that harm your skin? When a cheap, really all-natural alternative exists right now in your own house? I’m talking about baking soda. Is there anything that baking soda can’t do? It cleans, deodorizes, brushes teeth, and now, scrubs skin in a totally non-harmful, good for you kind of way – and since there are no fragrances or chemicals in it, it’s perfect for those with allergies. Just pour a small amount into your palm, dribble in just enough water to mix it into a paste, then apply to your face and cleanse away. I love the tingle you get afterward, and the softness of my skin. After I discovered this, I can never go back to store scrubs! Tip #2: Hydrogen Peroxide. Yep, the same stuff that you can buy for under fifty cents a bottle to disinfect your child’s scraped knees is also a skin beauty product! It’s a marvelous skin toner and makes those large pores on my face just disappear when I dab it on at night with a cotton ball. Plus, I use it for a mouth rinse – just be careful to keep it out of your eyes and don’t swallow it. Tip #3: Alice.com Ever notice how, when you go to Walmart or Target for a couple of necessary household or personal items that you end up shopping for things you don’t need and end up paying far more than you wanted? Here’s the perfect solution. With no shipping fees, and a minimum order each time of only six items (and it doesn’t matter how cheap the six items are or how heavy they are) you can have your necessary items shipping right to your door. Things like detergent, toilet paper, makeup, pet items, even food – and it’s even brand name products – and as cheap as you could get them at your local Walmart. You can even have Alice keep track of what you order and remind you to re-order when you’re starting to run out! No more running to the store constantly for those basic things of life – and you even have a chance to receive free items with your order, even really awesome items like free ipods! And for every friend you refer, you get a kickback of 3% of whatever they purchase. My dog loves it when the alice box comes in the mail since there’s nearly always something in it for her! Tip #4: Paperback Book Swap. If you’re a reader like I am, you’re always picking up books wherever you go. Thrift stores, book stores, garage sales; there is seemingly no end to the amount of books I can acquire in a year. And once I read them, where do they go? I used to donate them back to the thrift store, or, for those popular new titles that my used bookstore would accept, trade them in for a discount. That’s good, but this online site is better. You list the books you don’t want (and they can be basically any kind of book, even hardbacks and ex-library books, so long as they’re in relatively decent condition) and other people request those titles from you. You print a mailing label right at the site (including postage, if you don’t mind their small convenience fee) and mail them off to that person. For every book you mail, you get one credit…and this is where it gets fun. You can search a database of millions of available books and request them for free, one book for each credit you’ve earned. If they don’t have the specific book you want available, you can add yourself to a “wish list” and as soon as that book is made available, they put it on hold for you and send you an email. 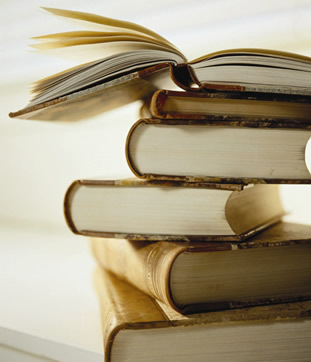 It’s marvelous, and this particular online book swap is better than the other ones out there. And one last tip: Tip #5. 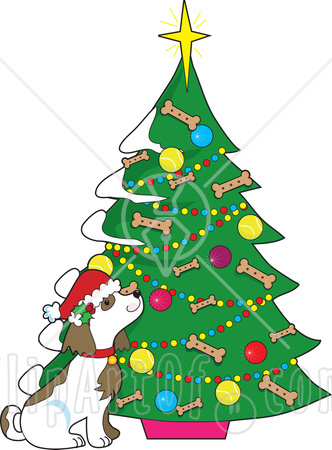 When Christmas tree shopping, it might be wise to bring your dog, or borrow a dog for the excursion. Why? Well, we bought our tree home from the lot, and noticed that our dog Jacks was very intrigued by it. We thought: “Oh how cute! She’s happy it’s Christmas!” But then, we discovered exactly why she was intrigued: one section of lower branches smelled of dog pee. (We’re assuming it’s dog pee; it could be bear!) After some branch-trimming, and some use of a spray deodorizer/sanitizer, the tree no longer smells of pee. However it also doesn’t smell of tree. And isn’t that a large part of having a live tree in your house? Learn from my mistake, take a dog tree hunting, and avoid any tree the dog “likes”! I’ve long been a friendly internet stalker of Aimee Major Steinberger. I love her various blogs, her art, her costume-making skills, and I adore her book on Japan. I didn’t think anything would make me want to go to Japan, but this book did! Plus, she’s a gardener, anime/cosplay fan, and a Dr Who fanatic. 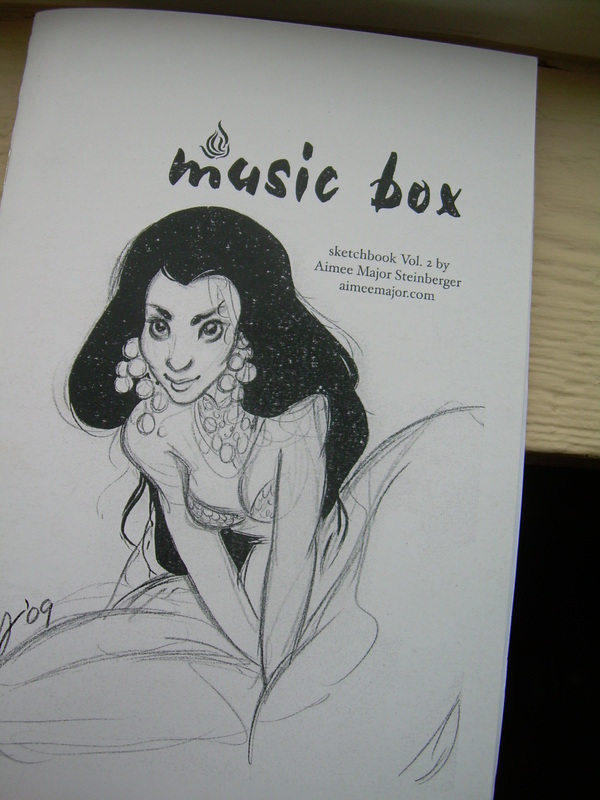 Recently on her blog, she offered copies of her sketchbook for $4 – and, if you ordered one, she would do a sketch of your choice in the back. Yes! 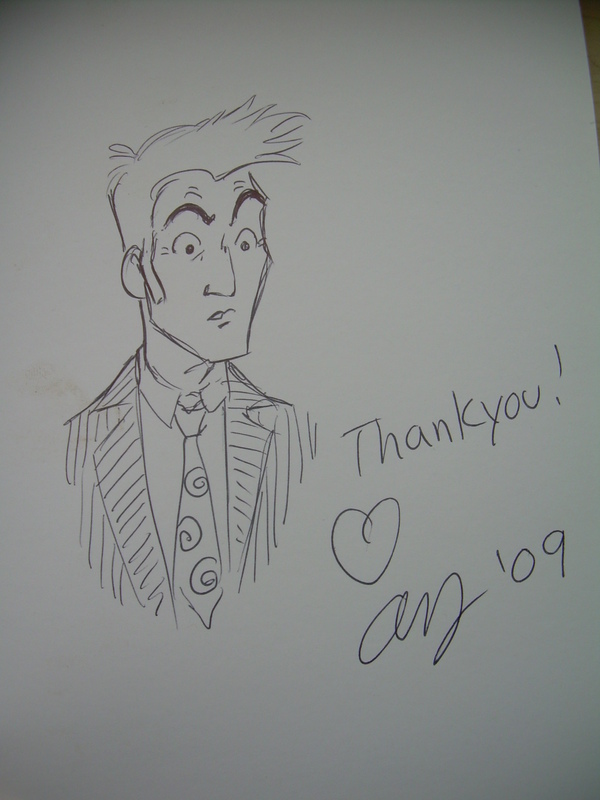 Yes, you know it….of course I asked her to sketch the 10th Doctor! And speaking of the Doctor, don’t forget that tonight is the US premiere of The Waters of Mars on BBC America. I’ve seen it, and it’s marvelous. After a little consideration (because I want to give ALL of you these samples), I decided the only fair thing to do was write your names down on slips of paper and have a drawing. This is nice, because Becky has never tried BPAL oils before, and it’s always fun to introduce new people to things that you love. For those who didn’t win, well, I have a new order for BPAL oils going in tonight, so there will probably be another opportunity to win my not-loved imps next month! And stay tuned, because I’m plotting to give away a couple of really cool things in the near future that aren’t BPAL-related! I first blogged about Black Phoenix Alchemy Labs a while ago, so click here if you don’t know who they are. 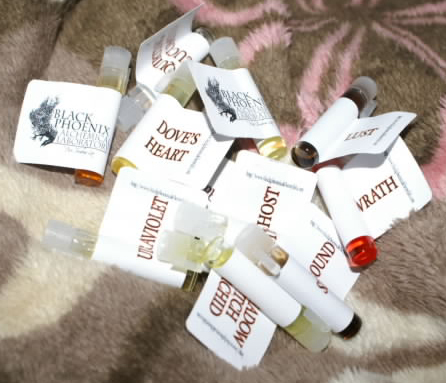 Since that post I’ve been collecting a bunch sample perfume “imps”, and now I want to find a new home for some of them. Some of the fragrances I don’t like on me at all, and others are okay but I just don’t wear them. These are basically like new imps, still full to the top! So here’s the giveaway: leave me a comment below with an email or way to contact you, and I’ll pick a winner and mail that person all my unwanted imps. Talk about a totally free way to try a few new perfumes! I follow Jorge (Hurley from Lost) Garcia’s blog “Dispatches from the Island“. He’s funny and down-to-earth, and I love his little mini-updates and adventures. 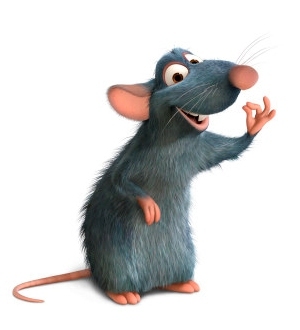 Recently, though, there’s been an Incident with a Rat in his home. And it’s the most hilarious thing I’ve seen in ages; it just keeps getting better and better. The video saga is not yet finished, but he’s posted parts 1 through 4. Click here for part one. Part two. Part three. And finally part four.